Gold is one of the world’s most precious metals. All of the gold in the world could be compressed into an 18-yard cube, which is about 1/10 the mass of the Washington Monument. A one-ounce gold nugget is more rare to find than a five-carat diamond. Even though gold is rare, it is far easier to find than winning a major state lottery. 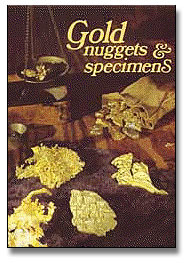 An authentic gold nugget has long been considered a gemstone because of its rarity and beauty. Gold is six to seven times heavier than other materials that equal its size. The largest gold nugget found in the U.S. weighed 195 pounds; it came from California. Gold can be hammered so thin that sunlight can shine through it. Gold can be hammered into sheets so thin that a pile of them an inch high would contain more than 200,000 separate sheets. In every cubic mile of sea water there is 25 tons of gold! That’s a total of about 10 billion tons of gold in the oceans; however, there’s no known way to economically recover it. Gold is considered one of the most important metals in jewelry making. Jewelry that is marked 10K is made of 10 parts gold, and 14 parts other metals. The hardness of pure gold (on moh’s scale) is 2-1/2 to 3; the melting point is 2,063 degrees Fahrenheit, specific gravity is 19.32, and tensile strength is 19,000psi. Gold can be transmitted from platinum by nuclear reaction. But, because of the rarity of platinum, it is far too costly. The United States government banned private ownership of gold, which lasted 41 years; then lifted it on December 31, 1974. Gold reached a previous all-time high price of $800 per ounce in 1980. An ounce of gold is based on troy weight–20 pennyweights or 480 grains. A pound of gold is 12 ounces, while most other non-precious metals are based on the standard avoirdupois scale of 16 ounces to the pound, and approximately 32 grams to the ounce. Gold is chemically liquified and injected into the muscles of thousands of rheumatoid arthritis victims in the U.S., and it is said that the treatment is successful in seven out of ten cases. Gold is used in window glass and astronaut helmets to reflect infrared rays while allowing sunlight to pass through, and at the same time keeping it cool. One of the best ways to get beyond your own uncertainty of what natural gold looks and feels like is to get your hands on some of the real thing. 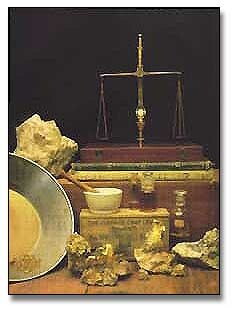 Once you have experienced real gold, you are much less likely to make mistakes. Here is a link where you can buy a sample of natural gold.